Lazy typists, rejoice: Facebook is rolling out a Shazam-like feature that will identify the music or TV you're enjoying, and let you share it with no typing required. But if you don't want to share your love of Justin Bieber or Carly Rae Jepsen, don't worry. Facebookers must actively opt to turn on the feature, which uses a smartphone's microphone to identify the audio. Here's how it works: Users will see an audio icon moving when they start to write a status update. 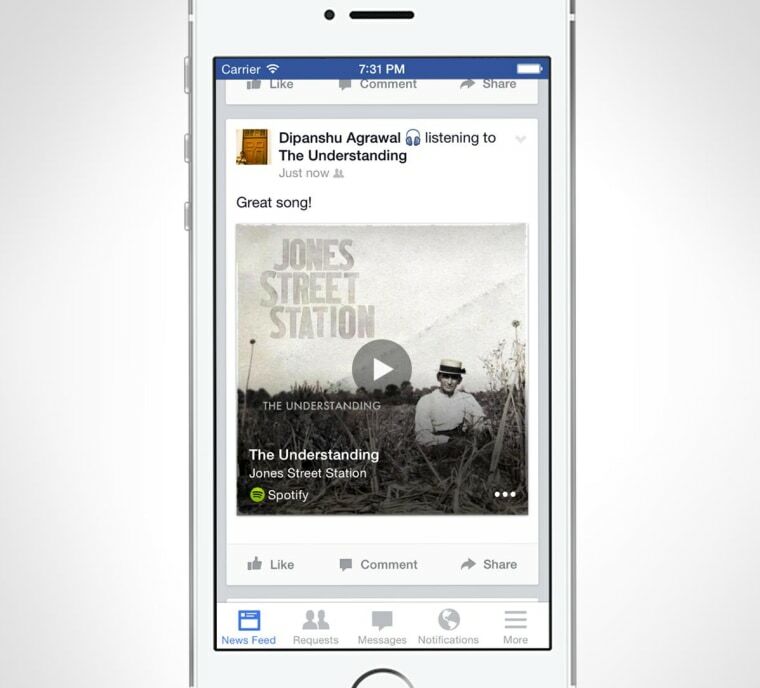 If Facebook finds a match, the user has the option to share the song, TV show or movie. With the music option, users can also share a 30-second song clip. Friends who click can play it through one of three music apps: Spotify, Rdio or Deezer (no money was exchanged for that partnership, Facebook told NBCNews). TV show posts will include the specific episode the user is watching, so friends have no excuse for commenting with spoilers. Users can share some items and not others, and the sound isn't stored, Facebook said. Facebook is starting with 160 live TV stations and "millions" of songs -- the company declined to get more specific. The feature, which is available only on U.S. Android and iOS apps, will start rolling out Thursday. Facebook said the new feature is an expansion of the "feeling and activity" posts the company rolled out last April -- you may have seen posts with "feeling accomplished" or "drinking an iced tea" along with cutesy icons -- of which 5 billion have been posted. "That popularity was a big impetus for us to push this forward," Facebook product manager Aryeh Selekman told NBCNews in an interview at the company's New York office this week. "We always had the idea that there were ways to make stories even more interesting, and we saw music and TV as a big opportunity." It's part of the popular and growing "second screen" space: the idea that we're using our laptops, tablets and phones while watching shows. Smaller startups have popped up to capitalize on that trend, as have established players like Facebook rival Twitter. One year ago this week, for example, the company launched Twitter Amplify, a real-time video partnership with broadcasters including BBC America and Fox.